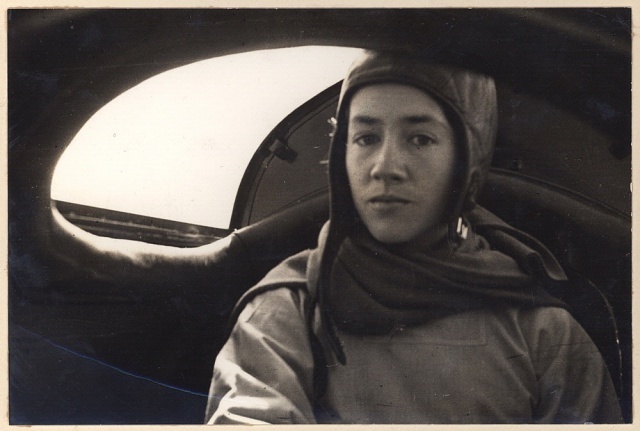 Anne Morrow Lindbergh, famous through her marriage to Charles Lindbergh, had her own career as a pilot. Shortly after her marriage in 1929, she became the first woman in the U.S. to earn a glider pilot's license. In 1930, she served as navigator, while seven months pregnant, when her husband set a new transcontinental speed record. In 1931, she earned her private pilot's license. Perhaps the most famous flight the Lindberghs made together was the 1931 Great Circle survey through Northern Canada, Alaska, and the Far East, described so eloquently in Anne's book North to the Orient. Anne served as a copilot and radio operator in the Lockheed Sirius now displayed in the Barron Hilton Pioneers of Flight gallery. The Sirius was also used for the Lindberghs' 1933 North Atlantic Ocean survey flight for possible commercial air routes for Pan American Airways. For her part, Anne Lindbergh received the U.S. Flag Association Cross of Honor. In 1934, she became the first woman to receive the National Geographic Society's Hubbard Gold Medal. Lindbergh established herself as a distinguished author as well; her literary works include Listen the Wind and Bring Me a Unicorn.